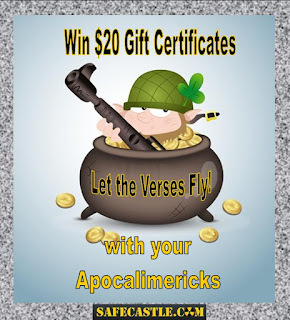 Win $20 gift certificates for your best original Apocalimericks during Preparedness Month! September 2015 is not only Preparedness month, but it is said it's going to be a barn-burner, so to speak. Let's make sure we have a little fun as the heat starts to get turned up, shall we? 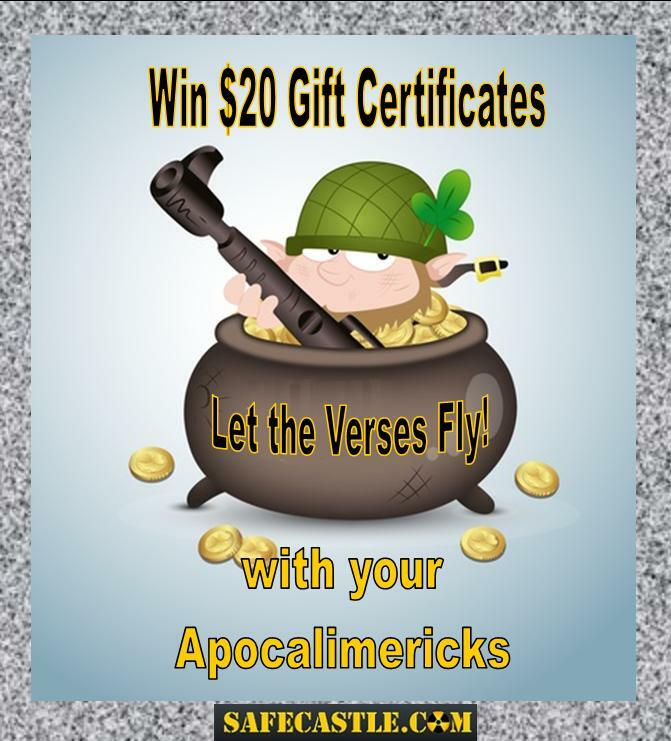 We're going to award a $20 Safecastle gift certificate to the author of every original Apocalimerick we post to our store site. Be creative, keep it reasonably clean, and make sure it's about prepping or zombies or existential crises, etc. We'll commit to awarding at least one gift certificate a week through September (don't make us regret that). Hopefully we'll find more than one submission a week worthy of one of these coveted awards. Our selections will be based solely on what makes us here at Safecastle laugh. One entry per week per person (Sunday thru Saturday. Note that Sept. 5 is the first week's deadline; Sept. 26 is the last week's deadline). Two gift certificates per winner thru the contest period is our limit. NOTE: Submissions must be original. That means if you post it somewhere before the contest is over and we do a search and find it, it won't be considered for a prize and publication on our winners page.